Mission Houlgate 2015 included the eighth annual Bible Exhibition (Expo-Bible) and a beach mission organised and run by a team from Missions Vacances, who are part of United Beach Missions (UBM). This year was different to summer events of the previous seven years. As well as Normandy Vision organising the Bible Exhibition at Houlgate Evangelical Church, a team from Missions Vacances held two weeks of activities for young people and older people, some on the beach, others in the church grounds, and still others in the church itself. 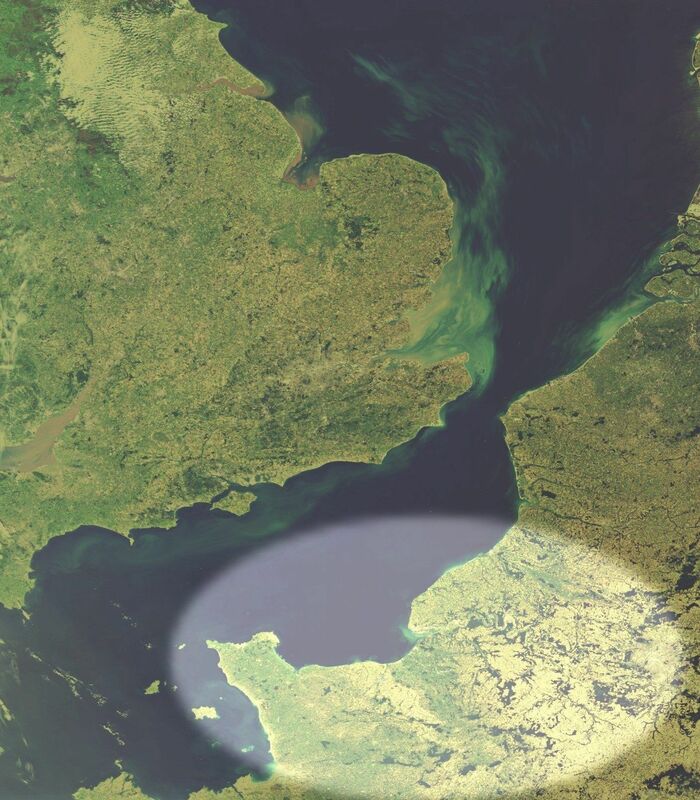 The joint Mission 2015 team started arriving on site at Houlgate Evangelical Church on the coast of Normandy on Friday, July 31st 2015. Others arrived on the Saturday, and then during the coming days depending which week or weeks of the beach mission they were involved with. The Bible Exhibition opened to the public on Wednesday, August 5th and remained open until Wednesday, August 19th. Beach mission activities were divided into two weeks, with the first week starting on Saturday, August 8th, and the second on Saturday, August 15th. Why were the numbers so low this year? One of the main reasons seems to be the weather! This was frequently not the ideal summer weather for people to be out and about in the town or sitting on the beach. There were two days of thunderstorms, and for much of the time the weather was unseasonably cold. What one of the Expo-Bible team wrote about Sunday, August 16th was typical: “There was a very cold wind blowing. The beach was not very crowded. Everyone had left the beach by 5:30-6:00pm”. On the positive side, Steve Taylor, who was head of the beach mission team from Missions Vacances, reported that the Expo-Bible team had several good contacts and conversations, including “a muslim man with his two grandsons who visited, and a man who chatted at length on one of the Wednesdays”. So despite the bad weather and lower number of visitors, as in previous years there were opportunities to interact with those who came to see the Bible Exhibition. There weren't as many Christian books and Bibles sold during this year's Expo-Bible as in most other years, mainly because of the lower number of visitors. Lots of free literature and gospels were taken, with tracts and leaflets about many aspects of the Christian faith available for visitors to pick up as they walked around the exhibition. We had a lot of free Gideon New Testaments available this summer, too, and they proved to be very popular with visitors. Several of the Christian books and Bibles on the bookstall were used by the Missions Vacances team to give to the young people who attended the Beach Mission meetings. English-language worship services were held at Houlgate Evangelical Church on Sunday morning at 9am on the 2nd, 9th and 16th. The meeting on the 2nd was organised by Philip Loose from Normandy Vision, with the Missions Vacances teams organising the meetings on the 9th and 16th. Though numbers attending the English-language services are usually low, those who come appreciate the opportunity to worship God in a language they understand, and to meet with other Christians. As in previous years, a significant proportion of those attending the English-language services were Dutch Christians. In addition to the English-language services, the Missions Vacances teams were also involved in leading and preaching at the French-language services on the 9th and 16th. The Beach Mission was held over a period of two weeks, beginning on Sunday August 9th. Initially there were some problems with holding any “religious” activities on the beach. Through meeting with staff at the Town Hall, and eventually with the Mayor, these difficulties were soon resolved and the Beach Mission team was able to continue with its activities. Local Christians from Houlgate were involved in supporting and leading the approach to the Mayor's office, and that helped enormously with the discussions. Daily activities on the beach included events such as teenage volleyball, and in addition to these activities, there were also times of talks about the Bible and the Christian faith, aimed not only at the children who met together to listen, but their parents as well. A good number of young people and their parents were involved in the activities and meetings on the beach and also with those that were held on the church premises. 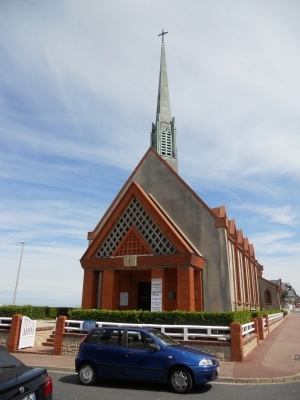 The church at Houlgate is right on the edge of the beach and the promenade, so it is easy to alternate between events on the sand and events on the church premises. Evening events were held in the church on Tuesdays and Thursdays. These included a musical evening, and also a talk on The Reliability of the Bible, led by Peter Williams, Warden of Tyndale House, Cambridge. These meetings were relatively well attended, especially considering the bad weather which discouraged people from coming out in the evenings. The Missions Vacances team was also able to help with the church's own mid-week Bible Study. Many of the church members were away on holiday, but with the Missions Vacances team helping out, these Thursday afternoon meetings were able to continue, with some from the town's Catholic church coming along, in addition to some visitors on holiday, and some from the Evangelical church itself. Overall this year, while there were several challenges to deal with, it was once again a time of opportunity for people to discover more about the Bible and the Christian faith, and through those opportunities, whether it was the Bible Exhibition, or events on the beach, or meetings in the church, to point people to the Lord Jesus Christ, who alone can save them and give them hope, in this life and for eternity.